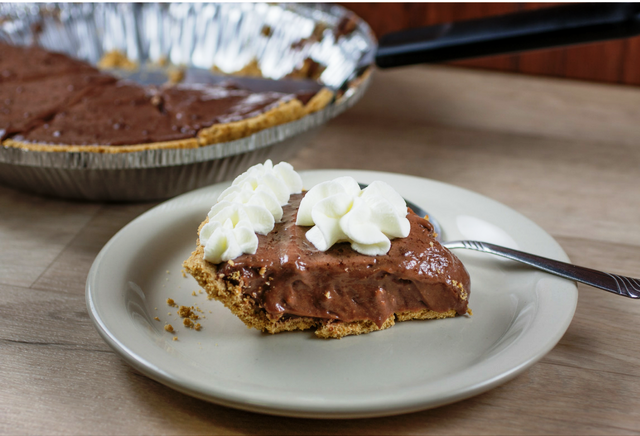 Believe it or not, I’m not a big chocolate fan and chocolate pie falls well below other favorite desserts on my list–with the exception of this one! In fact, when it comes to this pie, I have a hard time stopping with just one slice. I found the recipe, called Bonnie’s Chocolate Pie, in a self-published untitled cookbook. I don’t know Bonnie, but I’m sure glad she shared this recipe with the author. Directions: Combine eggs, sugar, flour, salt, and Nestle’s Quick Powder in a boiler. Add milk gradually stirring constantly until completely blended and smooth. Bring to a simmer and cook until thick like pudding. Stir in butter and vanilla. Pour hot pudding into crust. Allow to cool, chill in fridge, and top with cool whip before serving. If desired, garnish your pie with Hershey bar curls. Use a vegetable peeler to make curls. Bar should be at room temperature when making the curls, then transfer curls to fridge until ready to use for garnish.